By extending the pre-order concept to more travelers on short haul flights from October 2018, SAS now takes new steps to reduce food waste and to personalize the on board experience. Furthermore, the initiative is in line with the vision of the next generation of traveling. Starting from flights departing on October 1, 2018, it will now be possible to pre-order from the full day and evening menus on SAS Scandinavian and European flights from 80 minutes flight time, instead of 120 minutes as today, and thereby doubling the number of flights where pre-order is available. The initiative entails that pre-order options are now offered at a total number of approximately 80.000 SAS flights a year.Travelers have the possibility to choose from an assortment of 11 fresh food selections, including the well-received New Nordic by SAS salad cubes launched in spring 2017. “Pre-ordering meals are popular and appreciated among our passengers. It is a modern, premium and innovative service concept, which allows travelers to customize their journey and order precisely that kind of food they wish to enjoy on board, for example vegan, gluten free, or specific types of meat-dishes. This is why we have chosen to double the number of flights where the pre-order concept is available. SAS always strives to be at the forefront of innovation and pioneering the next generation of traveling. Pre-ordering meals when traveling with SAS is easy. Travelers can do it during the booking process, or choose to do so at a later stage by logging in to the “My bookings” page at the SAS website. Here they will find a wide variety of food, satisfying all taste pallets”, says Thérèse Lorenius, VP Product and Services. Extending the pre-order concept is a part of SAS’s environmental and sustainability work. Pre-order is an evident tool to reduce food waste, as it ensures the right amount and type of meals are loaded to match customer demands on each specific flight. While ensuring that the food SAS offers is tasty, inspiring and of highest quality, it is also a way to ensure low food waste. As ingredients and tastes change throughout the year, the New Nordic by SAS menus are optimized and customized based on the selected and fresh ingredients of the season. On European routes with a flight time on 3 hours or above, SAS continues to load a wide assortment of fresh food on board, including the New Nordic by SAS salad cubes during the day. Salad cubes will no longer automatically be loaded on European and Scandinavian flights shorter than 3 hours. Breakfast boxes, sandwiches, pizza and snacks will still be available to travelers in SAS Go without pre-ordering and SAS continues to offer travelers numerous food and snack options from the café menu which are continuously upgraded, latest by September 30, 2018. Copyright Photo (all others by SAS): Scandinavian Airlines-SAS Airbus A321-232 OY-KBB (msn 1642) PMI (Ton Jochems). Image: 943592. 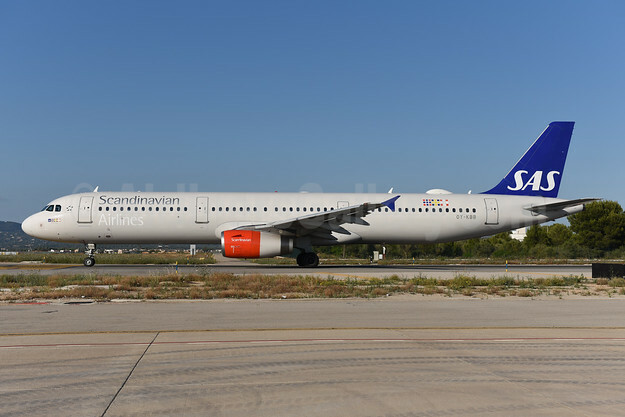 This entry was posted in Scandinavian Airlines-SAS and tagged Airbus A321-232, msn 1642, OY-KBB, SAS, Scandinavian Airlines-SAS on September 21, 2018 by Bruce Drum.